ALL MY MONKEES ALBUMS ARE STILL LINED up next to the old stereo in my room in my mother’s house; my friend Claire still has the ticket stubs and souvenir program from a Bobby Sherman concert; my sister keeps her David Cassidy memorabilia in an old “Partridge Family” lunch box at the back of her closet. We each quickly abandoned our idols after a short time. They hardly seem part of our past, but some fantasy we can barely remember makes us cling to those scraps. 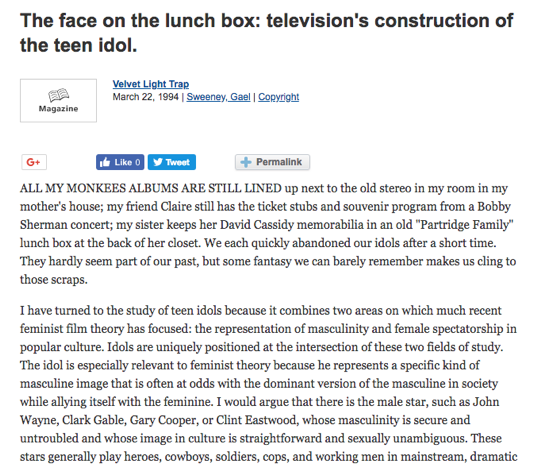 I have turned to the study of teen idols because it combines two areas on which much recent feminist film theory has focused: the representation of masculinity and female spectatorship in popular culture. Idols are uniquely positioned at the intersection of these two fields of study. The idol is especially relevant to feminist theory because he represents a specific kind of masculine image that is often at odds with the dominant version of the masculine in society while allying itself with the feminine. I would argue that there is the male star, such as John Wayne, Clark Gable, Gary Cooper, or Clint Eastwood, whose masculinity is secure and untroubled and whose image in culture is straightforward and sexually unambiguous. These stars generally play heroes, cowboys, soldiers, cops, and working men in mainstream, dramatic films. Their fans tend to be “average” moviegoers but skewed towards heterosexual white males, much like the characters they portray. The male viewers of these stars find their masculinity and power reflected back at them, confirming their status and superiority in patriarchal society. Stars depend on the gaze of other men for validation; although they accept the looks of others (such as women, gay men, or minorities), they need the authority of the dominant masculine paradigm to confirm their power as stars.